As I walked up from the mailbox a couple weeks ago, I glanced through the pile of stuff; a bill, some advertisements, blah blah blah, and then something caught my eye. 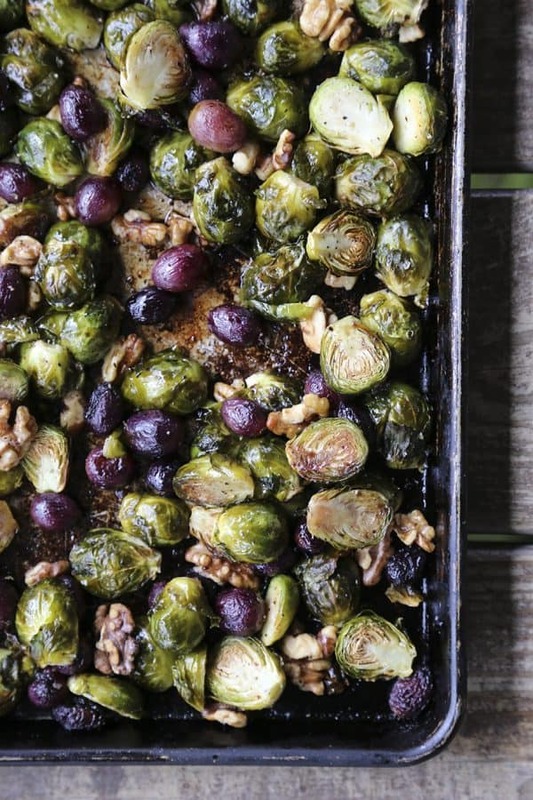 On the cover of the new issue of Whole Living was a pan full of what appeared to be roasted Brussels sprouts with grapes and walnuts. “Ooooh,” thought I, “That looks good. I’ll give that a look over as soon as I make myself a cup of tea.” I walked in the door, sat the magazine down and never saw it again. What happened to it? Who can say? What happens to anything that disappears in a home with five sons ages thirteen (for another two days) and under? Well, sometimes those things end up in the chicken coop under a pile of something I’d rather not describe on a food blog, or on the roof of the shed (not kidding), or buried under the gravel pile (with my soup spoon), or stuck on a pike in the boneyard (not so scary, really, it’s a place where kids found a pile of deer bones left by the previous owner of our property, now a fertile ground for much imaginative play) as a pirate flag, or crammed under beds/van seats/recliners. But the idea of the dish stayed with me. I didn’t want to overthink it, because Whole Living usually has lovely, uncomplicated, pure flavours in their recipes. They don’t get all wacky and difficult, God love ’em, so I decided the fewer ingredients, the better. I grabbed the ingredients I thought I would need the next time I went to the store and came home to try my hand at the version my imagination had supplied. I was assembling my pan-o-sprouts when my husband walked by, stopped and backtracked. “You’re putting grapes in with Brussels sprouts?” he asked incredulously. I decided to play it cool and replied with a, “Yep.” He shrugged his shoulders and moved on. Thirty five minutes later I pulled a tray of roasted sprouts and other goodies from the oven and took a deep whiff. Oh my. That smelled pretty good. I splashed balsamic vinegar onto the hot pan and vegetables and it smelled even better. I tossed it all together and it smelled best yet. Then I called Mr. Doubtful into the room. “Give it a try,” I said. I probably don’t need to tell you how well this would go with your Thanksgiving feast, but I should probably mention that we ate a full pan of this the first night I made it and forgot all about the rest of the meal. And I would be remiss if I didn’t tell you that with a little crispy bacon thrown in, this would be at home between a bottom layer of grits and a top layer of poached or fried egg. Then there’s that little matter of throwing together with pan-fried ham pieces for a quick hash. …I never did find my Whole Living, but I ran my version of the recipe past a friend who did not lose (or have lost on her behalf) her copy. As luck would have it, my method was the same and my end version differed only in the matter of quantity of olive oil and the fact that I didn’t include fresh thyme. Score another one for approaching a recipe with simplicity. I know that frozen Brussels sprouts are often more readily available, but I really believe the best texture for Roasted Brussels Sprouts with Grapes and Walnuts is going to come from fresh sprouts. Because there are so few ingredients in this recipe, you’ll find you have a better result when you start with a better product. Be sure to pick super fresh Brussels sprouts. If you buy ones that are dried out or older, they will yield a dried out roasted end product. Please start with walnut halves rather than chopped walnuts. The chopped walnuts are too fine and are likely to scorch in the roasting process. If you must use chopped walnuts, add them in the last 5 minutes of roasting. I find half sheet pans are by far the most convenient pan for roasting my whole batch of Roasted Brussels Sprouts with Grapes and Walnuts. If you need one, you can find them at restaurant supply stores, some big box stores, and Amazon.com. They’re a wonderfully versatile pan, last for almost eternity, and are very affordable. 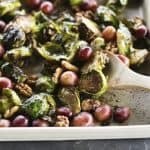 Roasted Brussels sprouts are mellower than their boiled counterparts, and when combined with intense roasted grapes, toasted walnuts and balsamic vinegar you have a perfect dish that you have to taste to believe. Try it with your Thanksgiving feast, or on a night when you want to make ordinary extraordinary. Inspired by Whole Living. Trim the Brussels sprouts of any dry ends and loose leaves, then halve. 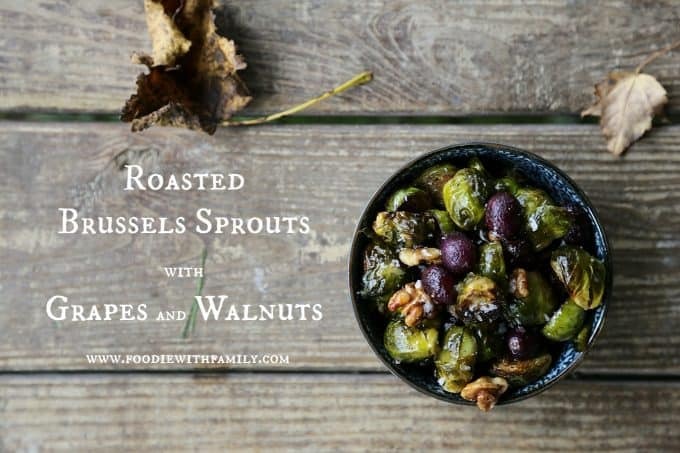 Place halved sprouts along with grapes and walnuts on a rimmed baking sheet. Drizzle the olive oil evenly over the top, sprinkle with salt and pepper and toss to coat. Roast for 30-35 minutes, or until the sprouts are well-browned in places, the nuts are fully toasted and the grapes are darkened in colour and very plump. As soon as you remove the pan from the oven drizzle the balsamic vinegar over the contents of the pan and toss to coat. Transfer to a serving dish and sprinkle with a little additional coarse sea salt. This post was originally published November 16, 2011, updated November 2015 and November 2017 with notes and links. The variety of flavors looks really intriguing. Gonna have to try this one. Thanks for the recipe! Enticing recipe! We very much enjoy roasted Brussels Sprouts, tossed in olive oil, salt and pepper. The addition of grapes, walnuts and balsamic vinegar is tempting a combination. With the muted red and green palette, I am thinking of making them for Christmas dinner. I tried these, and the brussels sprouts came out flavorful but dry. Not sure what I did wrong; not enough oil, or not cooked long enough, perhaps. The grapes, on the other hand, were a revelation. I made them last night all by their sweet selves as a side dish for a dinner party. They were a huge hit. Thanks once again for some fantastic inspiration. I made these tonight and ate almost the entire tray for dinner. They were even more delicious than I imagined they would be. Thank you for a wonderful recipe that will get made time and time again this winter! Do you think this would work with whole frozen Brussel sprouts? I think it would work but there might be some loss of texture since when they’re frozen the cell walls break down a bit. Please let me know how it turns out if you try it! hello! i’ve long used the recipe from the whole living magazine that inspired your posting. from the first time i tried it, i knew it would become a go-to for when i needed a yummy, healthy & impressive dish to take anywhere. i always just got the recipe straight from the internet–until 2 days ago when i went to retrieve it from cyberspace & they had removed it. the pics were all still there in the searches, but the recipe link had been removed. (this is when my frantic yet never give up search led me to your posting of the recipe. whew! panic alleviated.) i contacted martha stewart’s folks, shared my dilemma, & they sent me the PDF of the actual article, which included quite a few other gluten free yums for holiday festivities that i’d always meant to try but never had (since i never actually bought the magazine.). 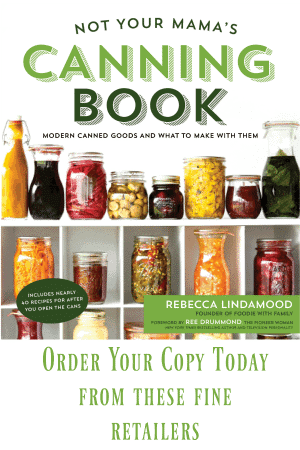 if you’d like me to email you the PDF so you can sample those recipes, as well, i’d be happy to share it with you! There are no grapes in my house, it’s about 19 degrees outside, and I have a surfeit of brussels sprouts. Do you think raisins could stand in here? I think I’m going to try it. Yes, yes, yes to all of this. I totally agree that simple flavors can result in such perfect end results. 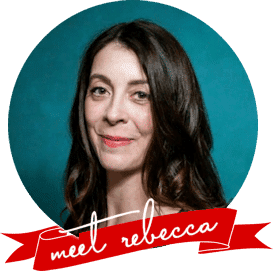 Love this recipe — and the story of how it came to be. Thanks so much, Sarah. It really is one of my favourite dishes. I look forward to it every single time I make it! I love roasted Brussels sprouts, which I usually do with just olive oil & black pepper. This recipe sounds like it’s well worth trying for when I want something fancier, and I love the idea of serving them with grits and eggs. I’ve been wanting to do simpler recipes, but they need to have flavor, so this one should do the trick. 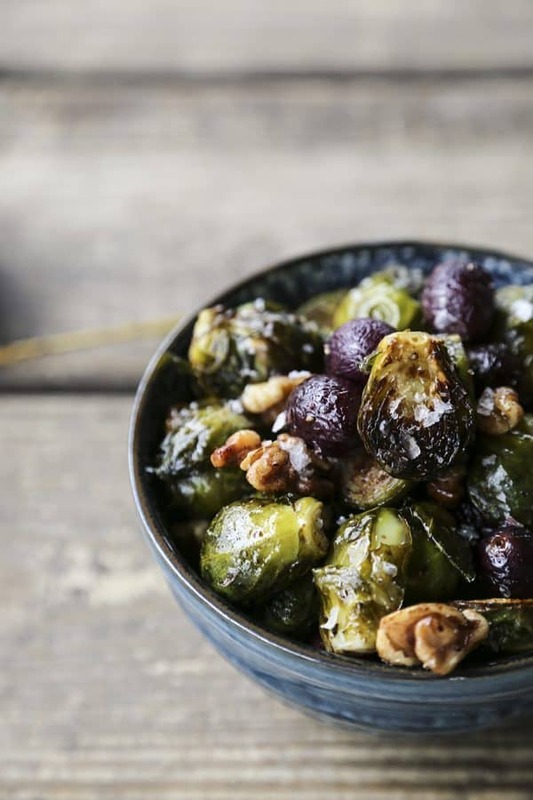 Brussels sprouts with grapes and walnuts produce a harmony of tastes. Thanks. Can you make this recipe 2 days before serving? If yes what’s the best way to heat them? I am also curious if anyone has tried reheating and what worked for them. And alternatively, is this good at room temp? What are the points for WW in this recipe? Hi Linda- I’m afraid I’m not familiar with the WW points system. I’m sure there are some excellent online calculators you can plug this recipe into for the information.